Food-grade, 275 Gallon, Full Cage, attached to pallet for stabilization and easy transport (forklift or pallet jack), integrated drain valve (2″). 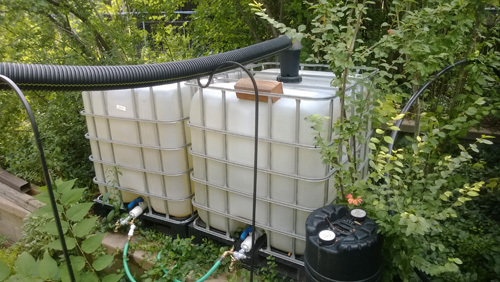 The picture of the bottom of the IBC Totes shows how we set up the plumbing. 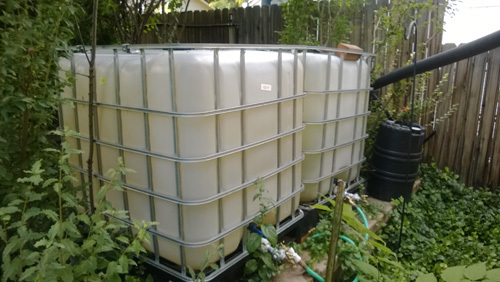 The goal was to allow filling one tote or both and to allow using the water from either one or both of the totes at the same time. Both hose connections are quick connect/disconnect type. Plumbing classes extra. Call ahead to inspect our totes (and see our other recycled products). We’ve got more ideas for using totes that customers share with us – and we’ll gladly share them with you. 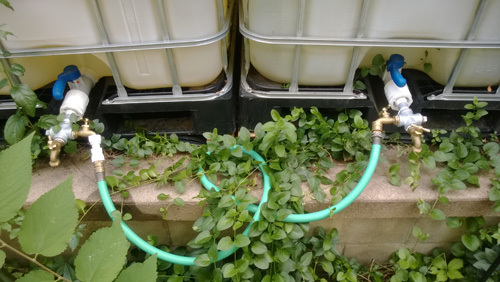 Store rain water for future use on your farm or in your greenhouse.